Both Little Cedar and Cedar Mountain hug the western shoreline of the Tennessee River/Nickajack Lake as the tail-end of Walden Ridge is broken up in the Tennessee River gorge and blends into the Sequatchie valley. The elevation gain and topography grant the Little Cedar Mountain Trail a dry side and a moist side; the wildlife and plants present reflect these subtle changes thus making the two loop trails a somewhat different experience as you hike within the parcel. Best in late fall, winter, and early spring. 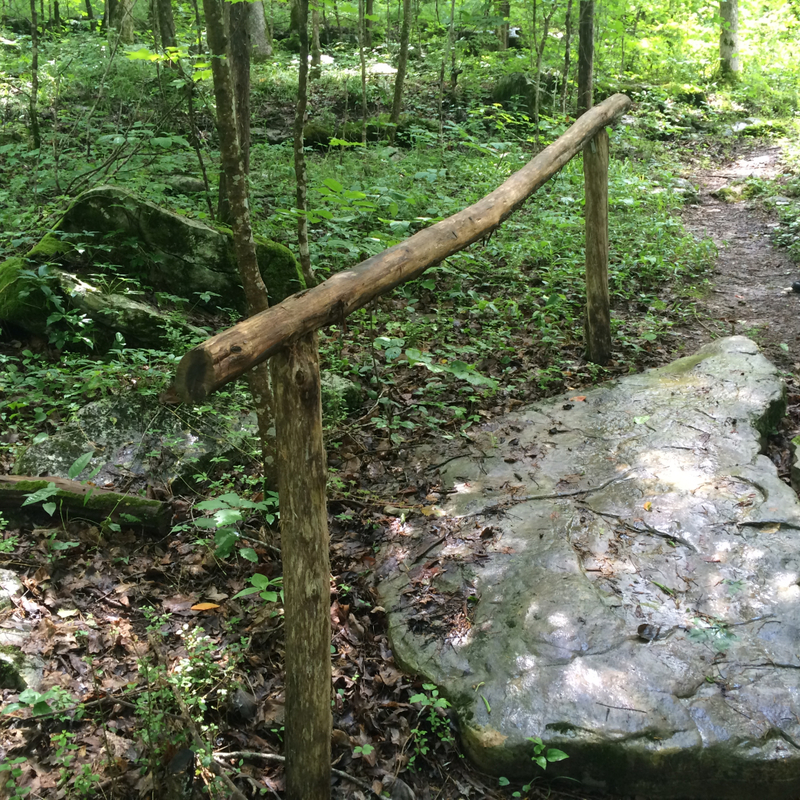 The Little Cedar Mountain Trail is a TVA trail located within TVA’s Little Cedar Mountain Small Wild Area. It is a total of 4 miles, including a loop trail and a short 1 mile trail to a tranquil wetland pond located on the ridge summit. Along the way you can view a plant unique only to this area of the world, scramble across limestone outcroppings, and have several opportunities for scenic overlooks of the Nickajack Dam embayment and Tennessee River Gorge. Begin the hike by crossing a wooden footbridge from the trailhead parking lot as it leads into the hardwood-pine forest. A little over a quarter of a mile into the trail, the loop trail splits. Veer to the left to go uphill and through an impressive assemblage of John Beck’s Leafcup (Polymnia johnbeckii ). This species of Leafcup was recently described as new to science in the past few years and is found in only two places in the world; one of these locations is along the Little Cedar Mountain Trail. With a soft, fernlike appearance, the Leafcup can be found flourishing along the trail and across karst topography. The trail continues approximately a quarter of a mile across the ridge and to the shoreline. Continue along the contour as the trail leads upslope for a little less than a mile to the pond trail or continue on another quarter of a mile to a scenic overlook. The pond trail is an interesting diversion as it leads to a small forested wetland pond at the top of Little Cedar Mountain. Vernal pools are seasonal, shallow depressions of water and provide important habitat for plants and animals, especially amphibians. This one is unique in that it is found along the top of the ridge and water remains throughout the year. It is a great opportunity for photos and exploration. Continue ahead to take the pond trail back to the remaining portion of the loop trail or retrace back to the loop trail towards a scenic overlook. From the spectacular panoramic view atop Gray’s bluff you can see across the lake towards Sand Mountain. The landscape within the remaining portion of the loop trail provides a different perspective, as it leads from the steep, eastern embayment side of the parcel to a more moist environment on the western side. There are many impressive geologic features on this portion of the trail. 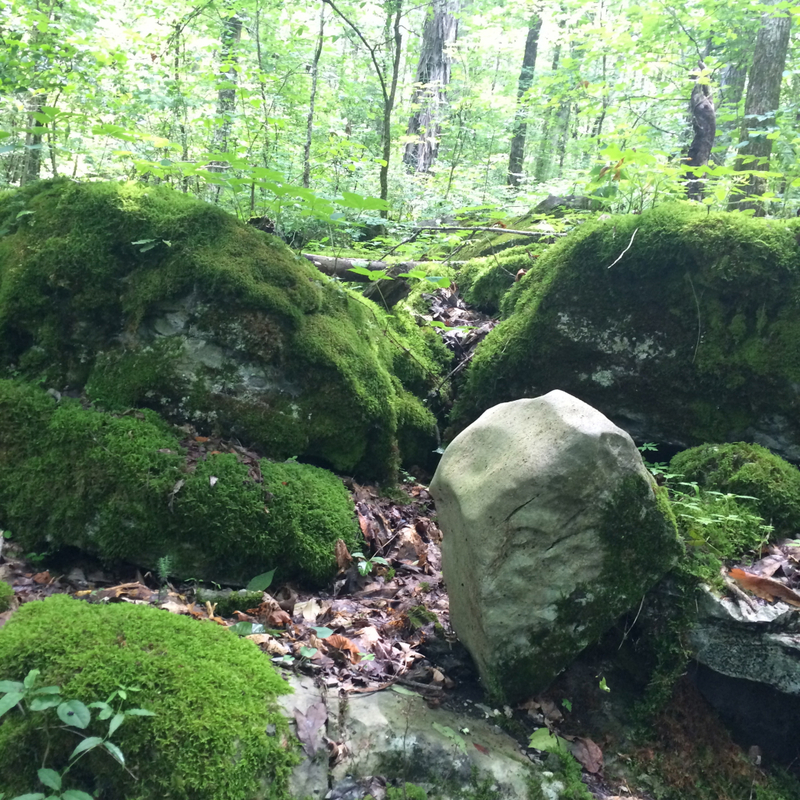 Stacks of boulders that border the trail, large rock footbridges, and mossy outcroppings of limestone and occasional chert. Look for owls and other birds in the large shagbark hickories. 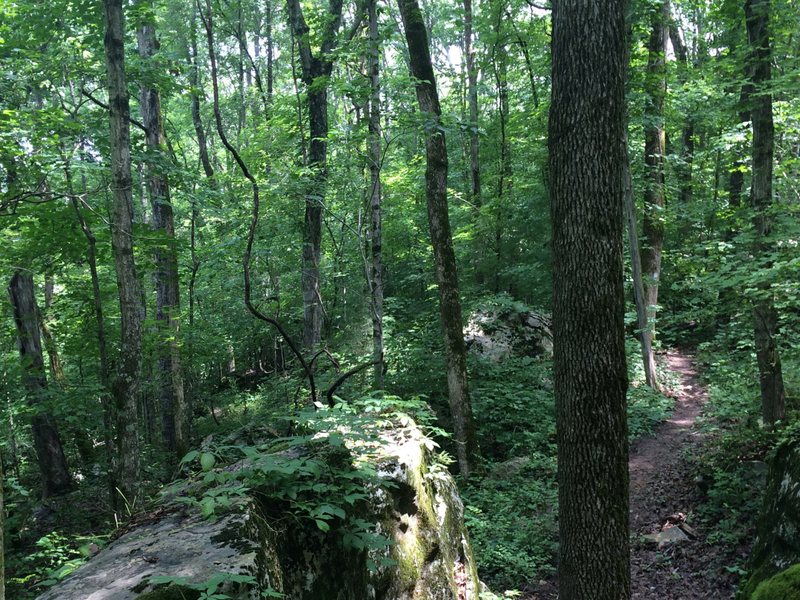 The variety of habitats encountered along this trail means that there is a little something for everyone (steep climbs, geologic features, scenic vistas, wildlife viewing, vegetated canopy, wetlands, and bluffs). Plus this trail is literally right off of the interstate. It is the perfect side trip to tag on if you are on the way to or going out of Chattanooga. 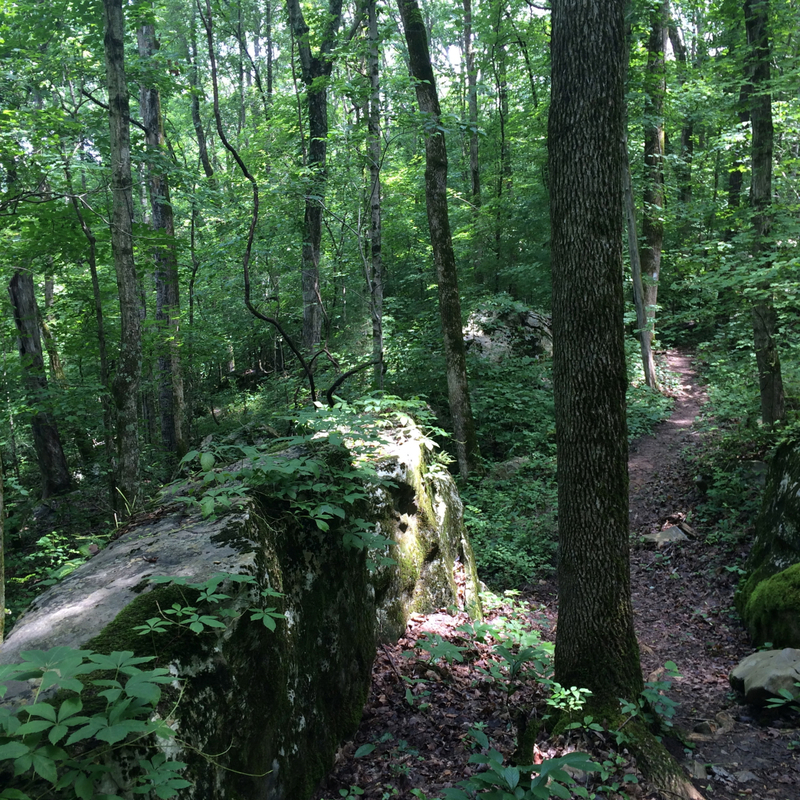 Naturalists and historians will love this trail as it winds through historic lands that were important to Native Americans and Chief Dragging Canoe. The location overlooks the former Nickajack Town, one of the five lower towns previously occupied by Native Americans. Take I-24 West from Chattanooga and turn left off of exit 158 to continue on TN 27W/TVA Road. The trailhead parking lot is approximately 0.3 miles on the left. Tennessee Valley Authority manages the Little Cedar Mountain Trail and this Natural Area for resource and scenic protection and hiking. Trailhead and parking lot signs are visible on the main road and there is a large parking lot. Foot traffic only.